This past couple of months has seen a frenzy of big ultras attracting big names to some exotic locations. With a brief breather before it all starts again with UTMB I thought it quite timely to share an account of my recent travels with the International Skyrunning Federation during the Transvulcania and Zegama marathons and how the life that we witnessed there could end up being more the norm for some of our elite competitors. We pick the story up between the two events. As the dust settles and the excitement of Transvulcania subsides, the athletes return to their day jobs of keeping in shape, recovering from whatever niggles they may have and focussing on their next race. 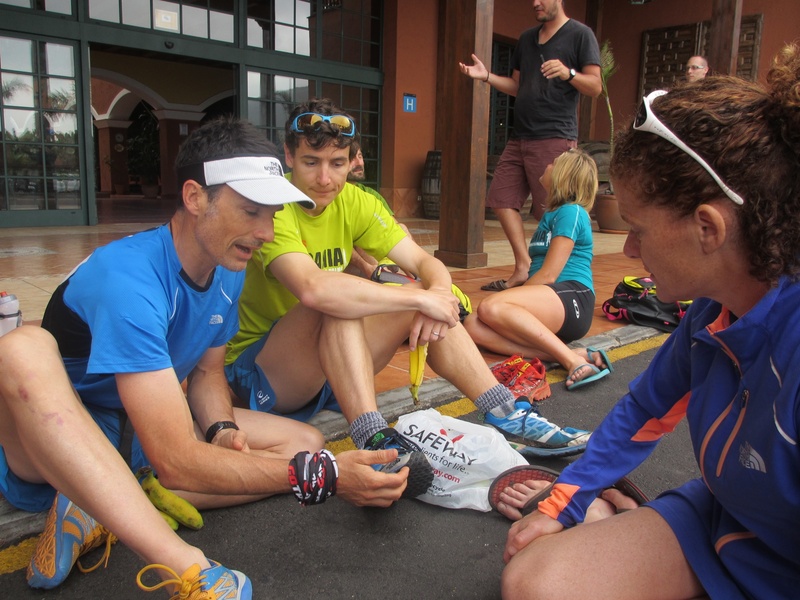 Normally, the runners would finish a race, jump on a plane and continue their recovery in the privacy of their own town, but as the Skyrunning Series moved to the Pyrenees and the famous Zegama Marathon a week later it meant the bulk of the elites stayed together. This has provided a unique opportunity to observe their behaviours and habits. So I thought I would try and capture a typical day. How the athletes interact, how they use their downtime, the type of training they do and the extensive media and commercial commitments they have. The day starts with me making my way to the restaurant for breakfast in the large rambling resort we are based in on the island of La Palma. Now you will have to indulge me somewhat for the next few paragraphs as I name drop with gay abandon. Sitting across from me is the American contingent deep in debate on the first big decision of the day, who is running and who isn’t. Leading the charge and chief pack leader is Mike Wolfe who is trying to convince the likes of Geoff Roes, Joe Grant and Dakota Jones to commit. Anton is already on board and is studying the maps with chief organiser Anna Frost. I am joined by Seb Chaigneau and Nikki Kimball who chime in with thoughts and ideas on the run, its duration, elevation gain and desirable surface. Max King looks like he has been ready for the past day and is bouncing up and down raring to go. 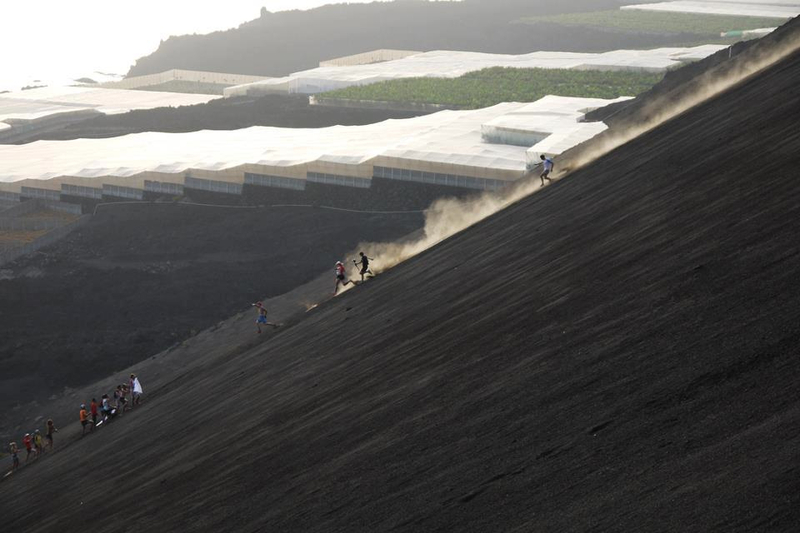 Salomon offer up a couple of their team cars and we round up approximately 12 of us to undertake a 2-3 hour run involving some climbing on one of the islands west coast volcanos. Another half hour passes while more maps are studied and more suggestions before we make an hours journey up the side of the island to the foot of the volcano. By now the temperatures are already in the high 20’s as we wind the narrow roads of La Palma. The banter in the car amongst the athletes crosses borders, cultures and languages and is no different to a typical Ultra168 training run. Shoes are removed and passed around and new design ideas are discussed, the radio is constantly being retuned to find songs to sing along with and above all the running talk dominates. We arrive at the mountain car park and visitors centre and runners fiddle with gear, fill water bottles, lace shoes, Frosty goes off to negotiate the national parks passes we need for the next day and before long we are off on the steep climb. The path winds its way on ancient cobbles and the group soon fragments. Max King shows what a good climber he is and sets an good early pace followed closely by Seb and Greg Vollet from Salomon. I settle in to a mixture of power walking and short choppy strides as we gain close to 700m over the next 40 minutes. I am soon joined by Anna Frost as she hung back to walk the flat sections with Anton before he passes us with what can only be described as a power walk faster than most of us can run. As Anna and I chat about the rest of her year we utilise the switchback to make the climb more comfortable as the heat is getting more stifling as we leave the cover of the pine trees. Anna then points up to a speck on a rockface. It is Anton taken the most direct route possible mixing his hiking with climbing. He soon reaches the summit as we peel off to the right and find a long cruisey firetrail. Anna, Nikki and Anton turn back and they will meet us on our return. I am now carried along at a pace way above my comfort zone by a who’s who of the running world. I soon fall off the pace and start to enjoy the mountains and the views towards the Sahara on my own. I think to myself – “Recovery Run – Yea Right, I am going to need one after this effort “ . The trail soon ends and the group politely waits for me with Seb orchestrating the non-running entertainment as usual with a joke and a story. Next is a steep descent into the crater of the volcano. This is where a decent pair of shoes is needed and it is reassuring to see the better runners find the surface pretty unrelenting on their feet. The scenery is like nothing on earth, as huge boulders thrown violently in the last eruption are strewn across the landscape. Some of us stop to take pictures, others checkout some rat runs off the trails and others race each other on the descent. To be honest it reminds me of children at play – carefree and with no forced structure to their activities. As the run came to an end the conversation moved to the rest of the day it became clear that the elites were having as much fun as me. We saddle up and make our way back to the resort for a late lunch. The quantity and quality of the food consumed is in keeping with the hungry looking faces all around and that the fue that goes in needs to be the best. On an aside, one observation about their eating habits is that vegetables and fruit dominate their plates with mostly fish being the protein of choice. Shortly after lunch the media room is filled with athletes quickly catching up with friends and sponsors over FaceBook and Twitter, Some of the runners are more prolific than others but it seems that all of them are comfortable in interacting with their fans. Some of the athletes who have their own website along with a blog and large global corporate commitment such as Seb Chaigneau can spend up to 20 hours per week on their social media and media commitments often employing assistants. 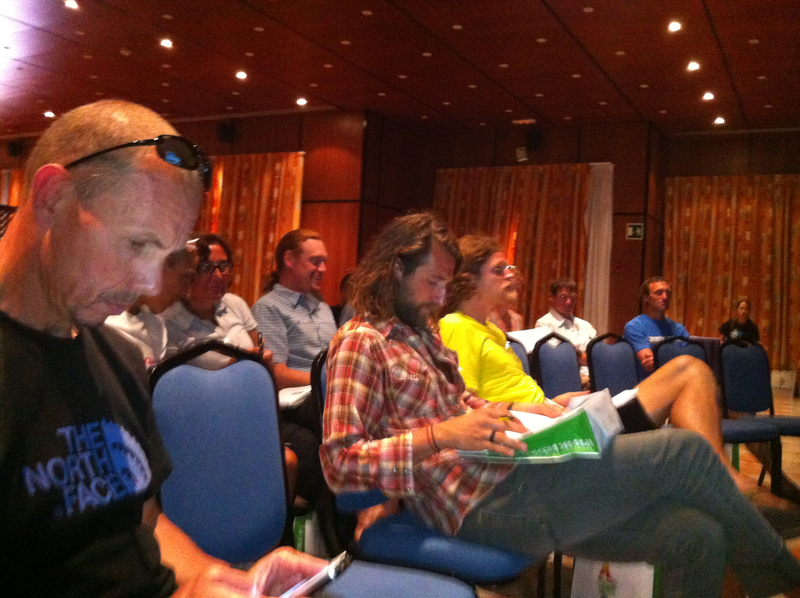 The afternoon is spent attending the International Skyrunning Federation’s conference. This is a coming together of the top 50 athletes, medical staff, members of the ISF, some of the brand managers from Salomon, Arc’teryx, Suunto and a collection of the worlds most influential media. It is expertly chaired by Lauri van Houten from the ISF who covers off the history of Skyrunning. It was amazing to see the looks on the faces of some of the modern day pioneers such as Anton, Kilian, Marco de Gasperi and Geoff Roes as the footage from 20 years ago shows similar exploits to today from the likes of Matt Carpenter and Marino Giacometti as they tackled some of the highest altitude climbs across 5 continents. During the refreshment breaks again conversation turned to the desire to summit some of the mountains seen in the footage and recreate their exploits. It becomes clear that the sport is coming together around a common theme – find a mountain and run up and down it as fast as possible regardless of location as long as the competition is fierce and the views spectacular. This was the opportunity for me to be actively involved as I was asked to present on the ever changing role of the media and I highlighted the success of sites such as Ultra168, iRunFar, Talk Ultra and Go Trail built around social media platforms and the ubiquity of smart phones and cameras. The debate continued as the athletes genuinely felt that in order for the sport to thrive and grow, granting further access to their lives was part and parcel of being on a global stage. It was great that the future is one that is collaborative and forward thinking enough to involve more than just the dictate of the big brands. As the conference wrapped up again talk returned to running and before long we were loading ourselves into a bus to head out onto the slopes of a volcano for some sunset speed work down the side of the mountain. As always the cameras followed our every move with various movie makers and freelancers all commissioned to capture their own unique insight into the lives of the runners on behalf of the brands. The patience of the runners and the work ethic of the photographers is something to behold. Repeated requests to return to the top of a ridge and run back down being chased by a StediCam to capture that perfect shot is something we all enjoy on YouTube but is somewhat harder to deliver in the real world. After some fun and games on the ash slopes of the the volcano we decide to enjoy the last of the long summer’s light and run back to the hotel. A quick shower and a ravenous appetite soon have us congregating in the lobby ready for the nights activities. 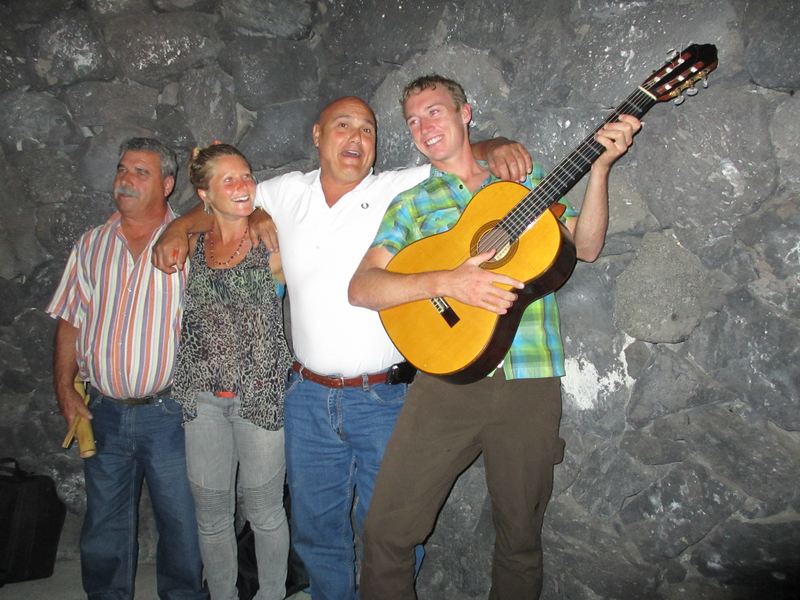 On the agenda this evening is a welcome party from the residents of La Palma. As we make our way back to the hotel it becomes clear that even in the most relaxed of environments the athletes still see themselves as role models and ambassadors for their sport, stopping to sign last minute autographs and that must have fan picture. A good nights sleep was had by all as the runners pack their bags and do it all again on the mainland at Zegama. 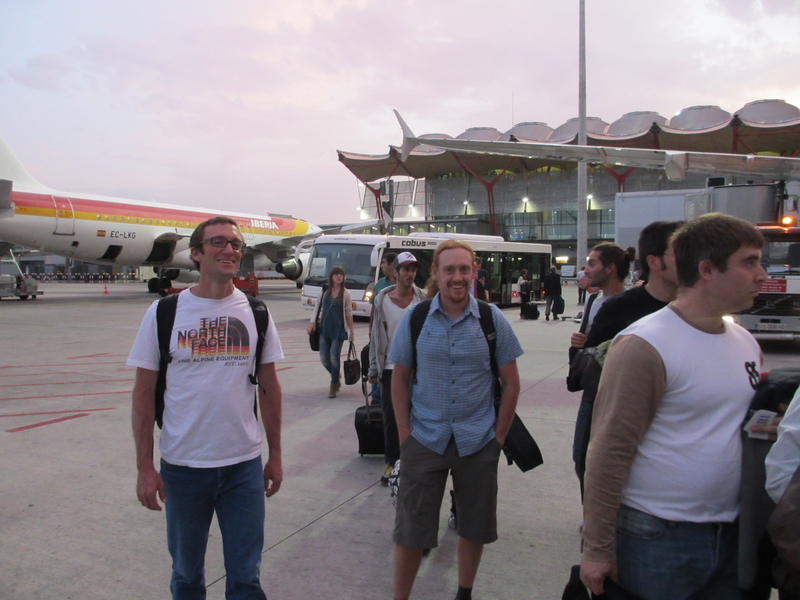 A couple of hours on the road to the airport, the usual battles with the check -in procedures as most of us are well over our luggage allowance, a quick check of FaceBook on whatever available WiFi we can find in the airport and we settle into a 3 hour flight to Madrid and then onto Bilbao. Yet again the the plane journey involves chit chat about running and a quick catch up on sleep. A late arrival into Bilbao sees the signs at the door of the airport directing us to our transport for the tiny town of Zegama. Its dark, raining, tiredness of the journey and the weeks activities start to take their toll on some people. Our local driver doesn’t speak English and so our estimated arrival time is still unclear. We eventually make it to the town well after midnight to be greeted by fellow runners and new ones from all parts of the globe. The energy and excitement of doing it all over again this time in the Spanish Pyrenees is palpable. Our beds and sleep are calling but there are so many old acquaintances to catch up with that it is the very early hours before we unpack and sleep. Again the ever constant search for an internet signal and whose network is receiving data is the final comments made before we crash. We rise to the sound of a rooster call and before we know it we are down at breakfast, maps at the ready, pointing up to the highest peaks looking to forge a new route – and the fun begins all over again. A great story on ultra running.